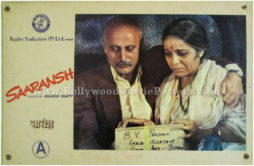 Old Bollywood still photo set of the cult Hindi film, Saaransh (1984) for sale. This is an actual surviving set of eight old Bollywood lobby cards of the 1984 Hindi film directed by Mahesh Bhatt that starred Anupam Kher, Rohini Hattangadi, Soni Razdan, Madan Jain and Nilu Phule. Saaransh marked the Bollywood debut of noted Indian actor Anupam Kher, who won the Filmfare Award for Best Actor for his remarkable performance in the film. The film received widespread critical acclaim and was chosen as India’s official entry for the 1985 Academy Award for Best Foreign Language Film, making this set of old Bollywood photos highly collectible! Printed and circulated during the original first release of the film (early 1980s), this set of eight old Bollywood photo stills was designed and printed to be used for publicity of the film inside a cinema hall as lobby card display. These old Saaransh Bollywood movie lobby cards were printed and issued to a cinema hall that actually screened the film. The four corners of the lobby cards feature punched holes and display tell tale sings of being pinned on the notice board of a movie theater. Saaransh has left an indelible mark on Indian cinema and remains one of the few critically acclaimed films from the 1980s era. It bagged several awards including Filmfare Award for Best Actor (Anupam Kher) and Filmfare Award for Best Story (Mahesh Bhatt).